These are car animations with moving backgrounds. You want to create at least two background layers if not three. If you have a moon, mountains or stars you may wish to not have that background move since it is so far away. Each moving layer has content that is turned into a movie symbol, then copied at least once and is tweened. If the car moves from right to left, then the background goes against the grain--from left to right. The backgrounds farthest away move slowely, backgrounds closer to the camera move more quickly. Normally the car doesn't move. We just create nested wheel loops to rotate the wheels. It will take probably around seven layers to create a quality animation. Notes on the Sample Car Fla file. Get the file here or from the school assignment folder. Bringing in a cityscape photo. Do a search like "city scape Gorst". Look for an image about the size of your stage. Import it to your flash library and drag it onto layer 1. Rename layer 1 to "Background 1". Use the show all view option for the stage and the free transform tool to fit the photo to the stage. You may want to resize your stage to the size of the photo. Remember you will probably have a road in front of the photo. You might make the stage black and push the photo to the top of the stage. Once the photo is positioned turn it into a movie clip or graphic symbol. (I named mine City1.) Then copy (Command-V) and paste it in place (Command-Shift-V). Move the copied symbol to the right (or left) with the arrow keys. Once it is positioned exactly adjacent use the free transform tool to flip the image. Now select both the original image and the copy and convert to a second symbol. I named mine City1-2. Now create a motion tween. Drag the tween to frame 300. Now go to frame 300 and while holding shift drag City1-2 so that the last image is perfectly aligned with the original start image on frame 1. Test and lock the layer. Using the deco building tool. Select the deco tool. 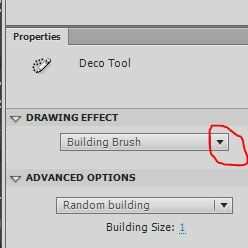 Under properties select the pull down menu and choose building brush (about halfway down the list of choices.) Touch the brush to the stage and drag vertically to create buildings. I like to space the buildings with spaces between them and fill the screen with four or five. Use F8 and create a movie symbol (City2). Now make copies to the right or left like you did above. You will want two copies. Select all three deco buildings on layer 2 and create a movie symbol (City2-3). This symbol you will tween. Stretch the tween out to frame 300. Now go to frame 300 and while holding shift drag City2-3 so that the last image is perfectly aligned with the original start image on frame 1. Test and lock layer2. Background 3 Layer. By now you should be an expert. This is the layer you will place objects close to the car. This could include store front buildings, street lights, road signs, fire plugs, fences, etc. You make symbol c3-1 from these items. Then copy four or five copies to build a fairly long symbol. You will tween that symbol to frame 300 just like the previous. Now you should have three layers that move like in Car-Sample. The moving road is the next layer. The bottom portion of the screen is black with a dashed yellow line running down it. If this is layer 4 call it "road". On this layer make a black rectangle to represent the road. Using the pencil create a dashed line. Under properties line can be converted to dashed and can be made wider. Then you turn the road into a symbol, copy repeatedly until you have a long road and tween just like in the previous layers. Now we are ready for the layer 5 named Car Layer. Building the Car. You can draw a car or you can cut out a car. It must be viewed dead on from the side to look right. Convert the car to a symbol (movie or graphic). Wheel rotating movie clip. This is essential to get the animation to look right. What we are building are nested movie clips. In the sample I will place the wheels in front of the symbol car. To be really professional you could build the moving wheels inside the symbol car. That way the wheels are mapped to the car and if you choose to tween the car the wheels will come along for the ride. Step 1 Draw or cut out a car. If you cut it out you need a clear background and the car saved as a png file. The car must be viewed from the side or the wheels will wobble and you will have a crab walking car. Step 2 Draw or cut out a round wheel. If you cut it, make it a png file as well. Step 3 Bring both the cars into Flash on separate layers. Turn the car into a symbol (movie clip or graphic). Step 4 Turn the Wheel into a symbol (movie clip) and select the center insertion point to make it rotate smoothly. Call this symbol Wheel1. Step 4. Edit Wheel1 (you can double click or use the symbol icon). Immediately select the wheel and turn it into a symbol (wheel2). On the timeline for wheel right click to create a motion tween. Then go to the properties panel and make the wheel rotate clockwise or counter clockwise depending on car direction. Step 5. Size and place wheel 1 in front of car and wheels should rotate. Same wheel can be used front and back. Optional Step 6. You can go inside the Car symbol. The car symbol is on layer 1. Add a layer 2. Drag the wheels (wheel1 symbol) onto that layer and place appropriately. No the wheels go with the car if you choose to tween the car at some point in your animation.